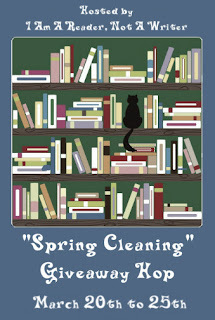 Jessabella Reads: "Spring Cleaning" Giveaway Hop: Win three awesome books from my shelf! "Spring Cleaning" Giveaway Hop: Win three awesome books from my shelf! Hey everyone! It's time for me to giveaway more books that I have extra copies of, or will just never be able to get to! I will list the books that I am giving away below. You may click on the covers for Goodreads. This will be U.S. ONLY.